VyprVPN is a feature-packed Virtual Private Network that allows you to securely browse the Internet with your desktop or mobile device. For users living in or visiting China and other restrictive countries, they offer a Chameleon™ service that defeats VPN blocking which scrambles OpenVPN packet metadata so that it is not recognizable. This allows users to bypass restrictive networks put in place by governments, corporations and ISPs to achieve an open Internet experience. In our test drive of this VPN service, we found the process to download their applications and use the service to require no help documentation at all. Their website backend was painless to use, finding the right application (in this case, Android and Windows apps) was easy and we were live with our VPN within minutes of accessing our account. Golden Frog has updated its VyprVPN service to support more platforms without compromising speed and reliability. Offers 50+ server locations, 200,000+ IPs with access to unlimited server switching and apps for Windows, Mac, Android and iOS. They currently only offer a 3-day trial with no free version available. Access to OpenVPN, L2TP/IPsec and Chameleon™ protocols require an upgrade to their pro service which also includes a 2nd simultaneous connection and a NAT Firewall. A VPN, or Virtual Private Network, offers several different benefits for individuals who value their online privacy, security, and freedom. Online Security – Hackers and third-party snoops can easily view your IMs, e-mails, and financial transactions when you browse unsecured networks without a VPN. By using VyprVPN’s top-tier 256-bit AES encryption, individuals can create a secure connection from any location and any device. With VyprVPN you can secure your personal and work-related communications and stop data sniffers from accessing your private information. Digital Privacy – VyprVPN protects your privacy and prevents your ISP from monitoring and controlling your online communications and browsing activity. Mask your true IP by connecting to VyprVPN and prevent websites from using your IP address to identify you or your location. Defeat Deep Packet Inspection and prevent ISPs from inspecting, prioritizing, and throttling the data sent to and from your device. Click this button to claim your first month of service for an instant 50% discount. Register for an annual account to save even more. No 3rd Parties – Golden Frog owns, engineers, and manages their own VPN servers in order to deliver fast and reliable connections, while other VPN providers use 3rd party companies to host their VPN servers. With VyprVPN, Golden Frog is the only company who handles your data, so your privacy and security are protected from end-to-end. Easy-to-Use Apps for Every Device – This service includes native apps for Windows, Mac, iOS, and Android. Additionally, VyprVPN also offers a Command Line Interface for Linux, a Router Applet for Tomato-based Routers, and manual setup instructions for other 3rd party software and devices. Their apps include several great features including Auto Connect, Port Selection, VPN Kill Switch, and more. Worldwide Server Network – VyprVPN offers 200,000+ IP addresses and over 700 servers among their 52 server locations. With servers located in 43 different countries, they are able to service its customers with reliable connections to global servers, and there are almost always at least a few servers close to the user’s geographic location, resulting in better latency. Since they own, run, and maintain their own network, these servers generally offer more reliable connections and faster speeds for VyprVPN users worldwide. VyprDNS – Encrypted, Zero Logging DNS – VyprDNS is Golden Frog’s 100% owned and operated DNS service available exclusively for their users. The zero-knowledge VyprDNS service increases user privacy and defeats censorship across the world. VyprDNS is built into VyprVPN and when a user connects, they will automatically use VyprDNS and be protected from DNS-based attacks and censorship, while also receiving superior DNS geolocation. Multiple Protocols including Chameleon™ – VyprVPN accounts include multiple VPN protocols for their users. The Basic Account only includes PPTP, so that account tier isn’t generally recommended compared to the Pro and Premier tiers. Pro and Premier Accounts include PPTP, L2TP/IPsec, and OpenVPN (160-bit and 256-bit) in addition to Golden Frog’s proprietary VPN protocol, Chameleon™. Chameleon™ is Golden Frog’s proprietary VPN protocol that allows users to defeat pervasive Internet censorship in countries like China or those in the Middle East where VPN connections are actively blocked using Deep Packet Inspection. To test this, I (Scott Buehler) had my 17 year old daughter hop on my office PC and showed her the email we received with our username and password and told her to get my VPN service up and running. I knew she had zero VPN experience nor did she know what a Virtual Private Network was. After a tiny bit of explaining, I set her off to get the service activated on my PC. Quickly, she accessed the VyprVPN control panel, entered the provided username and password and after about a minute of familiarizing herself with the control panel (shown above), she found what is shown in the screenshot to the left. She then downloaded the “VyprVPN for Windows” option, waited for it download, installed it (2 minutes) and launched the application. From there, she entered the username and password for our test account and activated with the “fastest server” option and she was off to the races. How long did it take to connect? After clicking the fastest server option, it took about 8 seconds to be live with a new IP on their VPN service. It also takes about 4 seconds to disconnect. 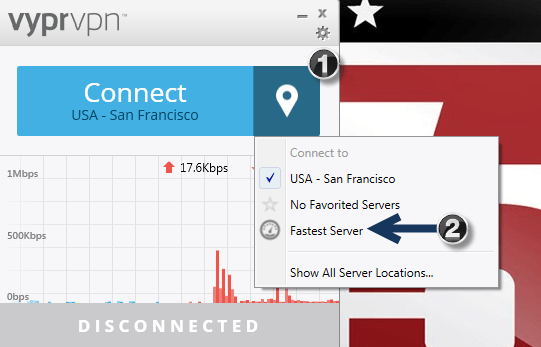 If you do not use the fastest server option and choose your location, it takes about the same length of time to connect. As you can see, we connected with the San Francisco location and was able to verify our IP address with IP Chicken, a simple IP verification website. There’s just no rocket science with this service. If you want to connect how we did, it just takes 2-clicks of a mouse to access the fastest server option as we show you on the right, however, once you find a location that works for you, you just launch the app and click the blue “Connect” button and within 10 seconds, you are live on their VPN. Very easy, very painless and my daughter or myself did not need any help documentation at all to get live on their VPN service. Once you join, you’ll be able to verify the entire process is very simple. Wow. This is incredible. The hardest part of getting on their VPN service on my Android device was entering my highly-encrypted password. Below, you will find 4 screenshots from my Google Android device running their Android app. Click the image to see the full size. When you first connect, your device will give you an important message making sure you are aware that this application will take over the Internet connection which is a safety feature Google Android has for obvious security reasons, especially for apps that aren’t VPN related. After that, you’ll see the 2nd screenshot where you can easily connect to any location and it’ll report your IP address, just like the Windows app does. 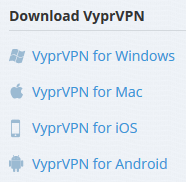 We haven’t tested VyprVPN on Apple iOS or Mac, however, by testing the Windows and Android apps, we’ve discovered that they will all work in the same way and have a similar process across all apps to keep things easy for the end user. Pricing: The prices in the screenshot and description below are based on their default prices you’d pay if you didn’t use our link to purchase. If you order through this link, the price you’ll pay will be reduced. VyprVPN Basic Plan – The cost starts at $6.67 per month billed annually when not taking advantage of our discount. Or you can opt for the monthly plan at $9.99/mo. This plan includes 1 connection, so you can’t use the service on your mobile and desktop at the same time. Only offers the PPTP protocol which doesn’t have access to the Chameleon features that protect/hide the fact that you are using a VPN. Also includes 10GB of secure file storage. 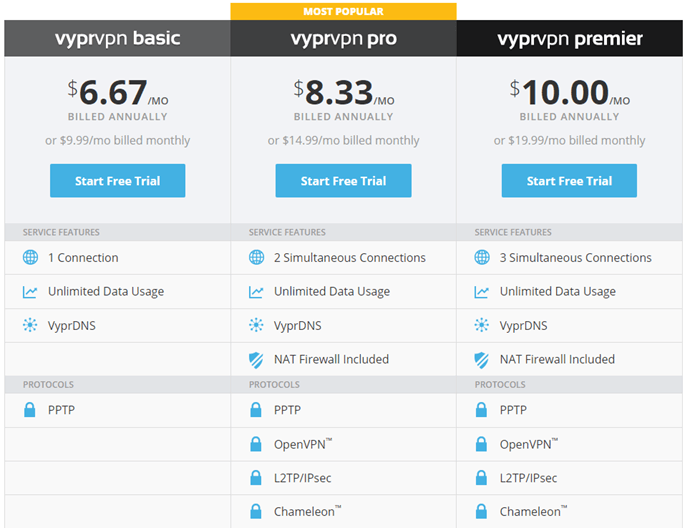 VyprVPN Pro Plan – Pricing is $8.33/mo annually or $14.99/mo when billed monthly. This is the most popular plan because it offers 2 simultaneous connections and access to all protocols and their NAT firewall protection. Also offers 25GB of secure file storage. VyprVPN Premier Plan – Pricing is $10/mo for annual plans or $19.99/mo billed monthly. The only difference between this and pro is you can use 3 simultaneous connections and you’ll have access to 50GB of file storage. The Top Five Advisor Recommendation: Start with the basic plan unless you are in a country like China where you need to bypass heavy Internet restrictions. Most people will only need to use one connection at a time, so take advantage of the cheaper price. VyprVPN offers servers in more locations than we’ve seen on any other platform. As shown in the screenshot above, there are lots of choices available. One really awesome feature including with this service is that you can perform unlimited server switching, which is a really beneficial feature for many of their users. Currently, they tout over 50+ worldwide locations on 5 continents. In total, they have 700+ servers, 200,000+ IPs with connections always being available for use. 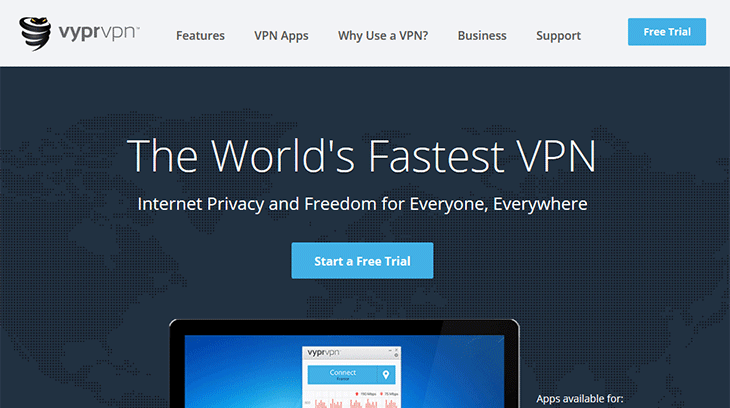 VyprVPN currently offers a 3-Day Free Trial for all users who sign up for the VyprVPN service. In addition to the 3-Day Free Trial, users can also access 500MB of free encryption by signing up via the apps in the Google Play Store or Apple App Store! With our special link, users will also be able receive 50% Off their first month of VyprVPN service! Or, if you’re ready to take the next step with VyprVPN, you can purchase an annual account for a better monthly rate! Virtual Private Network Homework – After taking your test spin, we would love to hear your feedback regarding their service. After a week, come back and let us know how things are going for you in the comments section below. Disclaimer: GoldenFrog provided Top Five Advisor a free account to test their service for this review which was used for screenshot, performance and other analysis.